NW-7000 USB Recording Condenser Microphone utilizes cardioid pickup pattern with condenser capsule, minimizing background noise and isolating the main sound source, highlighting the performance with smooth frequency response range; Plug-and-Play, no need to install any driver; Ideal choice for vocal, instruments, podcast, personal recordings and familiar situations. Adjustable Recording Microphone Suspension Scissor Arm Stand with Mounting Clamp: Double-braced arms equipped with super-strong spring, made of all steel construction, sturdy and durable; The adjustable arms can be fold up and easy for you to carry around; the mounting clamp can attach to tables, desks, shelves, counters, etc; Extend up to 25.98 inches/66 centimeters. 1.Install the stand clamp to table edge, tight it; Put the bottom part of the recording microphone stand into the hole of stand clamp, adjust its position, tight it. 2.Screw shock mount on the top part of recording microphone stand; Fix the microphone on the shock mount by pinching the clip of shock mount. Can be used in Mac without installing driver and Windows 2000/XP/7/8/10/Vista system; Strong output, no distortion, low power consumption; The Condenser Microphone only works with the device that could provide enough power(Voltage Required:5V) for it; When connected with desktop computer, the Microphone could be used alone; When connected with laptop computer, please connect the laptop to electrical outlet, or use a 48V phantom power to get enough power if the sound is not clear and high enough. 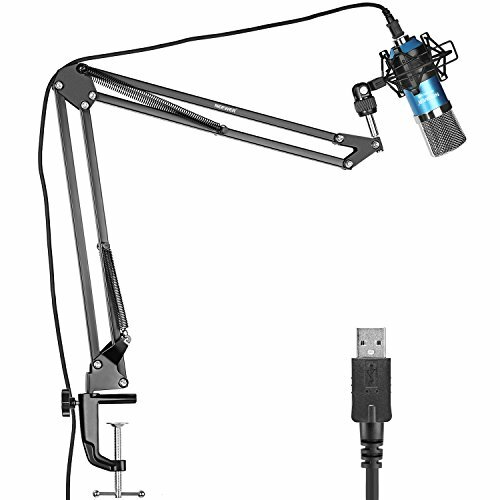 The adjustable scissor arm stand with mounting clamp is made of all steel construction, sturdy and durable; The adjustable arms can be fold up and easy for you to carry around; The mounting clamp can attach to tables, desks, shelves, counters, etc; Suitable for any stores, families, stages, studios, broadcasting and TV stations, etc.